The Netherlands is a country located in Western Europe, bordering the North Sea, between Belgium and Germany. It is located at the delta of three major European rivers (Rhine, Maas, Schelde). The area of land is 33,883 km2 and of water 7,643 km2. The geographical coordinates are 52 30 N, and 5 45 E. The terrain consists of mostly coastal lowland and reclaimed land (polders), with some hills in the southeast. The lowest point is -7 m (Zuidplaspolder) and the highest point +322 m (Vaalserberg). It is estimated that 8 % is urban land, 58% is agricultural land, 7 % is forest, 3% is natural reserve, and the rest is various. The population of the Netherlands is 17.084.791 people (2017). The GDP is 826.20 bill $ (2017), the growth rate 2.8 % (Q1 2018 compared to Q1 2017). The GDP by composition is agriculture 1,6%, industry 18,8% and services 79,6%. The Republic of the Netherlands was formed after defeat of the Spanish occupancy in 1648, with the Peace Treaty of Münster. In 1795 the Republic was occupied by the French Napoleon, and during 1810-1813 it was annexed and became part of France. In 1815, after the defeat of Napoleon in the Waterloo battle, the Kingdom of the Netherlands was formed. The territory included southern parts, now Belgium. In 1830 Belgium seceded and formed a separate kingdom. The Netherlands remained neutral during World War I, but suffered invasion and occupation by Germany in World War II. After World War II it lost its major colony Indonesia. The Netherlands was a founding member of NATO and EC, and participates in the EMU. The Netherlands is a constitutional monarchy and a parliamentary democracy with free elections every 4 years. The Government is formed by the King and the Council of Ministers. The King is privileged (can do 'no wrong'), the ministers are responsible. The King is head of State (Kingdom of the Netherlands, including overseas territories). The former Dutch Caribbean colonies of Curacao and St. Maarten became autonomous countries within the Kingdom of the Netherlands on 10th October 2010 in a change of constitutional status dissolving the Netherlands Antilles. The two joined Aruba, which in 1986 had already gained this status, while three other islands, Bonaire, St. Eustatius and Saba, became autonomous special municipalities of the Netherlands. The Prime Minister is chair of the cabinet and has a primus inter pares status. The Government is verifiable by the Parliament at any time and at any matter. The Parliament consists of a Second (Lower) Chamber and a First Chamber (Senate). The second chamber has most political power. The First Chamber has limited powers; its main task is to perform a second opinion on bills before becoming law. The members of the Second Chamber are directly elected by popular vote to serve four-year term. The members of the First Chamber are indirectly elected by the country's 12 provincial councils for four-years term. At national level there are 12 ministries, headed by a minister and (occasionally) a vice minister, responsible for a specific mandate (e.g. 'Infrastructure and Water management, Foreign Affairs'). The second level of administration are the 12 provinces, which have certain mandates on regional policies (e.g. planning, economy, environment), and regional implementation of national policy. Third and lowest level are about 380 municipalities, with extensive powers regarding local matters (zoning, social welfare, development control) and implementation of all kinds of national and regional regulations and relevant subsidy schemes. The system of provinces and municipalities are considered as territorial decentralisation. A special case are the about 22 waterboards, which have extensive powers pertaining to water management, both quantity and quality. The waterboards are considered as functional decentralisation, with specific general elections for board members, and an own tax regime. In 1810 the introduction of a fiscal cadastre became actual after the earlier mentioned annexation of the Kingdom of the Netherlands by France. The French legislation came into power. Some years before, in 1808, Napoleon Bonaparte, who needed money to finance his activities, decided to establish a system of land taxation, based on an accurate inventory of land use and land ownership, with precise land survey of land parcels: a fiscal cadastre. In 1811 it was decided that also in the occupied Netherlands such a system of land taxation should be introduced. As a consequence, in 1812 the work started to survey the land, and to list users and owners of the land parcels. The administrative structure in the cadastre was as follows. The country was divided in municipalities, and these were divided into cadastral sections, and these on their turn into cadastral land parcels. First the land surveyors, together with the municipal executives, determined the precise boundary of the municipalities. Then the land surveyor surveys the parcels. After the fall of Napoleon, when the Netherlands became independent again, King William I adopted the system of land and building taxation based on a fiscal cadastre, and the work was continued. In 1838 the work was finally done and a country covering fiscal cadastre was ready. Tax was levied on the value of land and buildings in terms of the revenue one could gain with it (the rental value). This rental value was assessed during the process of land surveying. The rental value was registered in the land registers and was fixed. The regulations didn't have any provisions for updating rental values. Only if land parcels were divided or joined together, the rental values were divided and joined together according to the extent of the new surface area. With this respect the cadastre always showed a more or less actual situation. New erected buildings were appraised by comparing them with similar existing buildings, so they were put on the original scale. The amount of the tax itself was based on a so-called repartition‑system. First it was decided by the national government which part of the national budget should be provided by the land and building tax (at that time this tax was a state level tax). The resulting amount was split up to the provinces, then to the municipalities and finally to the individual land parcels. It could happen that the amount of tax was different from one province to another. Anyway, at that time the rate was about 10% to 12% of the rental value. The updating of the cadastre was based on changes in the legal situation of land and buildings. It was a major effort to have knowledge of these changes. Legal documents could be recorded at the local courts. The clerk of the court acted as a kind of land registrar. However, as another Napoleonic rule, in 1811 it was decided that these legal documents, mainly deeds of transfer and of mortgage, should be recorded at the local office of the national tax department, in order to levy transfer taxes. Such a recording became compulsory in 1824. Thus there were some sources for investigating the changes in the legal status of land. It became much easier however, when in 1825 it was decided to join together the legal land registers and the cadastre as a special department within the national tax department, the Ministry of Finance. It was a decision by the King himself, aiming at efficiency reasons only. Here lie the roots of the Netherlands Cadastre and Land Registry Agency, in which ‑ unlike many other countries ‑ the land registration and the cadastre are combined in one organisation. The cadastre became a key to the public registers, even more when in 1838 a new Civil Code came into power that ordered the inclusion of the cadastral land parcel number in notarial deeds of transfer and deeds of mortgage. The fiscal cadastre also became a juridical or legal cadastre, a situation, which is still a benefit at date. A major revision of the Civil Code came in power in 1992 (symbolically called the 'new’ Civil Code), together with the Cadastre Act as a specific elaboration of the parts pertaining to the system of property rights (to a thing), and its aspects of registration and cadastre. This constituted the land registers and cadastral maps as a multi purpose system aimed at providing legal security of tenure, facilitating the land market, and supporting many government activities like physical planning, development control, public acquisition of land, land taxation, management of natural resources. Per 1 January 2004 the Cadastre Act was adapted in support of the merger with the Topographical Service of the Ministry of Defence, establishing the Cadastre, Land Registry and Mapping Agency. Nowadays, jointly with twelve other government registrations the authentic cadastre registration, the cadastral maps and the topographic maps of Kadaster are appointed as authentic registers of the governmental information infrastructure programme. The land register and the topographical register were both designated by the programme back in 2008, being two of the six key registers that formed the core of the key register system, consisting of the data that is considered as the true identifying data, such as persons, addresses, buildings, land cadastral parcels, businesses and base geography. Land registration and cadastral mapping are tasks at national level, assigned by mandate (Civil Code and Cadastre Act) to the Netherlands’ Cadastre, Land Registry and Mapping Agency (Kadaster). As said earlier, this organisation formed since its establishment in 1838 a department of the Ministry of Finance. However, under the political expectation that land information played more and more a role in many other government activities (especially in planning and environment) the Council of Ministers decided to shift the department to the Ministry of Housing, Physical Planning and Environment in 1974. In the same period it was decided to move the land taxation from the national to municipal level, which still is the case. In 1994 the Council of Ministers decided to transfer the department into a so-called independent public body, recognising land registration and cadastre as a public task but to be executed in a business like way. Kadaster was constituted by special law, the 'Cadastre Organisation Act', precisely prescribing the mandate, and the division of tasks and competencies of Kadaster, the Minister, a Supervisory Council, and a User Board. Today, Kadaster has a head office and 7 regional offices. Kadaster collects and registers administrative and spatial data on property and the rights involved. This also goes for ships, aircraft and telecom networks. Doing so, Kadaster protects legal certainty. Kadaster is also responsible for national mapping and maintenance of the national reference coordinate system. Furthermore, it is an advisory body for land-use issues and national spatial data infrastructures. In the Netherlands a system of licensed private surveyors mandated to do the cadastral survey, does not exist. All boundary surveys are performed by land surveyors employed by Kadaster. As such there is no involvement of the private sector. However, the private sector plays a role in the sense of being contracted to do specific jobs under the supervision and responsibility of Kadaster. The private sector is a lively one, comprising many firms working on a commercial basis. Kadaster has a framework contract with 6 of these firms. At date various levels of surveyors have their own association. Senior staff members of Kadaster (surveyors, land registrars, managers etc.) are normally member of the Association for Cadastre, which is mainly a labour union type of association. GIN is an interactive meeting place and is an open knowledge network for everyone who is professionally involved with geographic information. GIN organises activities and encourages and facilitates sharing and transferring knowledge of its members in development of all members and to strengthen the position of the field of geo-information in society. There is no licensing system in place. All cadastral surveying is performed by employees of Kadaster (civil servants). The field of geo information in the Netherlands has developed into a vital and dynamic branch over the last decades. The geo sector does have an issue: the educational institutions face the challenge of keeping up with the demand from the labour market. There are specialised geo information studies and studies where geo information is being part of. Kadaster supports educational institutions with knowledge, data and is offering students internships. Kadaster employees are offered an Kadaster Academy to continue learning during their careers. The land registers and cadastre serve a multi purpose aim. Legal certainty in land transactions is promoted. The Civil Code prescribes 4 requirements for a legal transfer of rights 'in rem', namely right of disposal of the seller, agreement between buyer and seller, obligatory title, and recording in the public registers held by Kadaster. The system of delivery is ‘causal’, which means that right holders have to secure their ownership right ('title') from a theoretical legal point of view in the chain of transfers. Because of the latin notariat, in practice information from the most recent notarial deed and court rulings suffices and gives substantial evidence of ownership. The registers cadastral maps and survey documents therefore guarantee in practice legal land tenure security, and security in the land market. The same is valid for securing loans by mortgages. Information on taxable persons, taxable objects, and taxable values, are derived from the files of Kadaster, and are on a regular basis supplied to the municipalities as main source data for their land taxation. Furthermore land information from the registers of Kadaster is used by many government bodies, basically providing source data in order to support the government (all levels) in the interference in private property rights justified by the general interest. This includes topographic information and information on utilities. Kadaster promotes an efficient geo-information infrastructure integrated with a system of national key registers. The Netherlands only has one single land registry and cadastre. It comprises all lands, and all territorial waters, whoever is the owner. The State owns land, of course, however from a point of view of the civil code the State is an owner like anybody else. Also the rules for transfer etc. apply to the State, except for paying land taxes. Something as 'state lands' does not exist. There are no problems with informal and illegal settlements. The main concept of the system of land registry and cadastre is the recording of the relationship between persons and land, through a formal right. The concept includes the principles of specialty and publicity. The specialty principle results in a proper identification of the right holders through personal identification at the notary office and the recording of ID numbers, or in case of a legal body (e.g. a company) identification of ID number Chamber of Commerce and the legal representatives of the company. Furthermore it impacts on the object of exercise of rights: the land parcel, that should be uniquely identified by parcel number and boundary survey. The right as such should be legally recognised, namely belonging to the closed system of real rights as mentioned in the Civil Code. The right should therefore precisely be identified in the deed. The recording of the relationship person-right-land can be recognized throughout all proper well-functioning land registration systems in the world and suffices the registering of notarial deeds, seizures, official notifications and court rulings. Acceptance of a submitted deed, by the land registrar, does not imply investigation and review of the legal validity of the transfer. In other words: there is no check on the identity of the buyer or seller. The registrar also does not check the validity of the title, but checks on some precisely described formal requirements only. In addition, the registrar can officially warn the parties involved and other parties by adding a declaration in the cadastre and recording an official declaration in the land register (Article 19 section 4 of book 3 of the DCC (Burgerlijk Wetboek). Unlike a title registration system, the system in the Netherlands does not provide state guaranteed proof of title, (mainly) because of the lack of (obliged) registration of all cases of adverse possession or cases of inheritance. The publicity principle however, results in the compulsory recording of all deeds pertaining to land, which are open for inspection without any restriction, and provide the base for knowledge about the status of tenure. The combination of Latin Notariat and land registers and cadastre provide de facto title security. According to the legal rules of accession, buildings belong to the land, as are subsurface features and above surface air column. Buildings and minerals can be separated from the landownership through e.g. rights of superficies. As multi use of space is official national policy, such constructions are getting common both at sub-surface, surface and above surface level, which brings along developments towards a 3D registry and cadastre. Improvements related to the accuracy of represented boundary points in the cadastral maps are ongoing. Final objective is that the quality level of every individual boundary is described and as close as possible to the quality of the field data. Efforts are being made to systematically include impact of divorce and inheritance. Public registers are registers in which notarial deeds, seizures, official notifications and court rulings are registered as they come in. Public registers are comparable with the land registers kept by the courts in other countries. The reason for filing in this order is the importance of the ranking of real rights. The Civil Code (Roman-French law family) assigns two important characteristics to real rights, namely a real right follows the thing, and older real rights have priority over younger real rights. With respect to the latter, the moment of recording can therefore be of crucial importance, e.g. by legal foreclosure and execution. The public registers by consequence are not easy accessible. The employees of Kadaster extract the essential elements from the deed; these form on their turn the input for the cadastral registers and map, providing registers on name, parcel (both administration and cartography), and street address. In essence the cadastral registers and map are auxiliary registers to provide access to the public registers. The cadastral registers and map as well as the public deed registers are kept in digital format. Update processes are streamlined. In more than 40% of all updating processes the notarial deeds and judicial officers` seizures are done without human interference; the computer does update the land register and cadastre automatically and without one second. In addition to the basic relationship men-right-parcel there are many attributes: land use, purchase prices, various legal essentialia, parcel surface area etc. 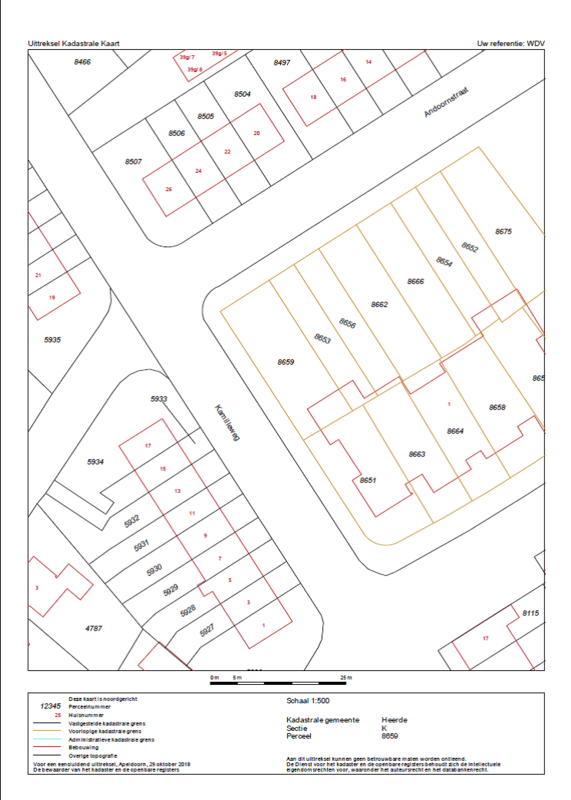 The spatial cadastral database is a key register. The database includes parcel data: boundaries and parcel_id’s. Topographic data are not included; but those data are being used for presentation purposes on the cadastral map. This means buildings, street names and house numbers are represented. Topographic data are maintained in a separate key register: BGT. Both Cadastral map and BGT are served on the website www.PDOK.nl. Users can see and download a large variety of geo-data for their own use. The cadastral maps represent the cadastral situation of the complete territory of The Netherlands. Boundaries of provinces, municipalities (administrative and cadastral municipalities) cadastral sections and parcels are included as objects in the spatial cadastral database. Original evidence from the field, including measurements, are stored into a seperate database. Figure 1: Example of a cadastral map. The cadastral map (BRK DKK) and the Key Register for Large Scale Topography (BGT) of the Netherlands (both country covering and digital) are key registers by law. The map series share building-data. Both maps (databases) are extensively used by governments, utility companies, and private companies for their own activities. The Key Register for Large Scale Topography (BGT) is a detailed digital map of all of the Netherlands. On this type of map, all objects such as buildings, roads, water, railway lines and green spaces are displayed in a uniform fashion. Kadaster contributes to the creation of the BGT by providing de the national service and by distributing the BGT thorough the NSDI PDOK. Kadaster is constantly questioning itself how to perform its public tasks in the best possible way. In general, this involves delivering products and services that meet the customers’s need and comply with juridicial and cost-covering conditions. We strive for maximal efficiency, always considering the criteria for quality that we have agreed upon with our customers, principals and financiers. We estimate that by 2020, new technology will have enabled citizens and business to perform acts that before only professionals, like Kadaster, were able to perform. We expect a growing need in society for self-activity to which we aim to respond to with Crowdsourcing, Open Data, Provisional cadastral boundaries and the Reallotment portal. To be able to determine a cadastral boundary themselves, the cadastral map will be improved by connecting more quality information to the lines in the map as well as a better access to detailed survey documents. If feasible, Kadaster will improve the quality of the lines itself. However, this is still in research. We experience that information is increasingly easily accessible and available for citizens, businesses and government. We are the source of high quality and authoritative information. Traditionally we have provided this information for land administration purposes, but increasingly this also holds for data on use in the spatial domain and cables and pipelines. We also provide information in 3D. Users want to be certain of the information they use. We deliver the data and information on which our customers can rely. 2. We provide the information platform that enables all users to work with spatial information. Serving customers’ needs has always been an objective of our agency. In this information age cadastral and spatial information (processes) are links in the full customer journey. Information provides not automatically the answer to the users’ demands. As Kadaster we are able to provide our customers with the essential information because of our in-depth knowledge of spatial and legal data. We make validated and user-ready data and information available and accessible to our customers. This gives the user the opportunity to focus on his own processes. 3. We are partner for the use of spatial information to solve societal issues, both within the Netherlands and internationally. Spatial and legal information often helps our partners to arrive at better solution for the solution of their problems. We can provide both information and knowledge in the spatial domain. Considering the complexity of society we team up with partners from government, private sector and academia to provide that spatial information which is pivotal in solving our customers’ problem. Working in this way also helps us and our partners to improve and fine-tune our services and to innovate.